Landscaping is not just about plants and lawns. You need to set a stage for your plantings around which to design. The technical term for this is hardscaping. By definition Hardscapes are parts of your landscaping that are impervious or solid in design. The team at Hutcheson Horticultural is experienced in the design and installation of residential and commercial hardscapes that include retaining walls, water features, walkways, patios, driveways and much more. In generating a landscape design for our customers, we consider much more than just creating a beautiful environment. Hutcheson’s design team will produce a customized plan for each client’s specific needs. 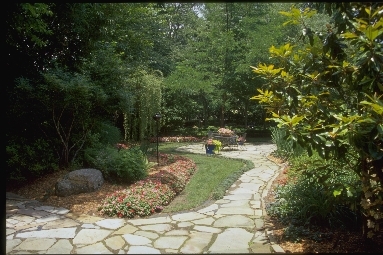 The rolling topography of the Atlanta area and especially Cherokee County can present unique considerations when planning hardscapes. Whether it is drainage issues, maintenance requirements, elevation changes or aesthetics, our design concepts will encompass a relevant solution to each problem while incorporating a professional eye for a beautifully balanced landscape. For our patios and walkways we offer a wide variety of materials including concrete, pavers and a variety of natural stone. Retaining walls may be constructed using concrete block faced with brick or stone, 6″x6″ pressure treated timbers or decorative concrete stone. We also take in to consideration, practical considerations such as engineering and design to ensure structural integrity of our hardscape installations. When choosing the building materials in your project we take in to consideration the desired appearance and find appropriate materials, various colors, and textures to compliment the design style of each project. Regardless of your choice in material or desired style from contemporary to rustic, Hutcheson Horticultural will complete the job with the highest standards of quality and workmanship. For more information on our design and installation of hardscapes in the Atlanta area contact us by phone at 770-924-1001 or use the convenient “Contact Us” feature on our website.